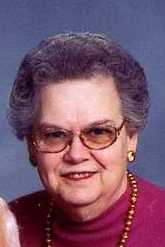 [May 11, 2009] MOUNT PULASKI -- Jacqueline L. Creager, 72, of Mount Pulaski, died Saturday, May 9, 2009, at 6 p.m. at Abraham Lincoln Memorial Hospital in Lincoln. Her graveside service will be at 10 a.m. Tuesday at Steenbergen Cemetery, with Ryan Edgecomb officiating. Fricke-Calvert-Schrader Funeral Home in Mount Pulaski is handling arrangements. Mrs. Creager was a homemaker. She was born Nov. 9, 1936, in Springfield to Floyd Earl and A. Pauline Miller Dennison. She married Davy Lee Creager in Springfield on Nov. 9, 1954. He died Jan. 5, 2006. She is survived by two daughters, Paula Jean Creager of Springfield and Caryn Martin of Athens, and a grand-dog, Molly. She was preceded in death by her parents, husband, three brothers and one sister. She was a member of Veterans of Foreign Wars Post 755 Auxiliary of Springfield, MOLB, was an avid book reader and loved taking care of her family. Memorials may be made to Mount Pulaski EMS or the donor's choice. Click here to send a note of condolence to the Creager family.